Some would-be move-up home sellers are eyeing home prices carefully. They’re waiting to see how much home prices appreciate more before they consider selling their home. But they may be missing their perfect opportunity, some housing experts say. The best time to move may depend on when the home owner purchased their current residence, says Daren Blomquist, vice president of RealtyTrac. Blomquist says that home owners who purchased their home during the sluggish market the last two to three years may find moving up in 2013 may be their prime opportunity. "Because they bought near the bottom, these home owners should have built up some good equity that can go toward the purchase of a new home, and waiting longer to build more equity likely won’t provide much advantage given that other homes that they might want to move up to will also be appreciating at roughly the same pace," Blomquist told HousingWire. Home owners who wait much longer to sell their home may miss out. "If you're selling one house just to move up to another, it does you no good to wait for prices to rise — the price of the move-up home will increase faster than the price of the place you're leaving behind," says Redfin CEO Glenn Kelman. Plus, mortgage rates are expected to come off the 3.5 percent range and reach 4.4 percent in the next year, according to the Mortgage Bankers Association. That will increase the costs of financing your next home. Buyer Demand Soars, But Where Are the Houses? Buyer demand is rapidly rising, but the housing market is realizing they may not have the inventory to meet it. After years of not building, homebuilders are scrambling to ramp up production to meet demand, but they’re facing delays from the availability of lots, scarcity of qualified labor, and obtaining permits. Meanwhile, investors have snagged foreclosures and short sales, limiting the availability of those on the market as well. In addition, more home owners — once underwater — are seeing the return of equity again for the first time in years, but still may be reluctant to sell as they wait for home prices to rise even more. Or, they might be wary of being displaced themselves if they sell due to the sudden buying frenzy, The New York Times notes. “You see a home go for sale and within a couple days there are three, four, six offers,” says home buyer Carrie Miskawi, who has been looking for a new home for the last six months. Sacramento real estate agent Tom Phillips says he’s even resorted to knocking on doors of homes to see if the owners might consider selling to one of his clients. The number of homes for sale is at its lowest level since 1999, according to the National Association of REALTORS®. But with mortgage rates still low and home prices off their peak, buyers are viewing it as an opportunity to jump in. Housing starts surged in February as well as future permits for future construction to the highest levels since 2008 — a sign that the new-home market is picking up steam just in time for the spring buying season, the Commerce Department reported Tuesday. Overall housing starts rose 0.8 percent in February to a 917,000 annual rate. Single-family housing starts, which make up the biggest bulk of that total, reached their highest level since June 2008. Meanwhile, multifamily starts rose 1.4 percent in February to 299,000 units. "Demand for new homes and apartments is definitely rising as the spring buying season approaches and more young people move out on their own," said Rick Judson, chairman of the National Association of Home Builders. "Builders are responding to this improved demand by putting more crews back to work and pulling more permits for future construction, though this positive activity is being constrained by continuing issues with appraisals and credit availability for both builders and buyers, and also by newly arising challenges such as lot shortages and increased costs for labor and materials." While housing starts have shown a big improvement in the past year, economists say that homebuilding is still less than half of what it was during its prerecession peak and is near levels in the early 1990s. Interest Rate Update! 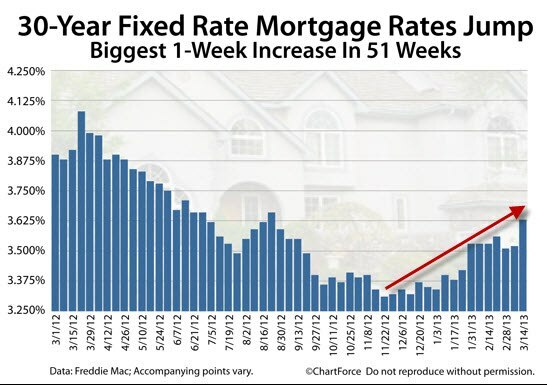 The 30-Year fixed rate mortgage rate has increased to 3.63% and just posted its biggest 1-Week increase in 51 weeks! Mortgage rates have climbed steadily now since November 2012 and have increased from 3.25% to 3.63% during this period, which is almost half a %. Mortgage rates have now started 2013 worse than any year since 1996. Many are predicting that mortgage rates are on their way over 4% soon! Remember, it just takes a 1% increase in rates for a buyer to lose 10% in purchasing power/affordability! Home values could surge 35 percent without stretching housing affordability, Raj Dosaj, vice president of the home price index at LPS Applied Analytics, said during a recent webinar hosted by HousingWire. Dosaj says that the increase in home prices could be less than that if mortgage rates rise, which he says they are predicted to do. "During the peak of the housing run-up, affordability was stretched as the market sold off," Dosaj said. "As home prices dropped, affordability dropped." Industry reports are showing home prices rebounding and rising across the country. "There are definite signs that there's room for growth," said Dosaj. "Things are generally looking good for the housing market."